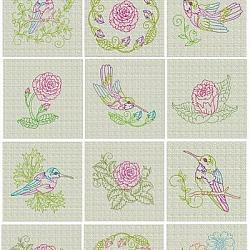 Needle Little Embroidery is proud to share what others have to say about your design purchases. We believe that the endorsement of a happy customer is the best advertizer. Please read below to see what others have to say about NLE's quality designs ! 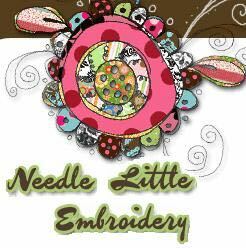 If you've been pleased with your purchases from Needle Little Embroidery or would like to leave a comment on how you have used your designs, please take a moment to add your comments here. I love the designs and am very happy with how they stitch out. My very first purchase I used on a jean jacket that belonged to my dad. Issues I had with keeping the fabric didn't stop the design from being stitched out. I think it looks great. 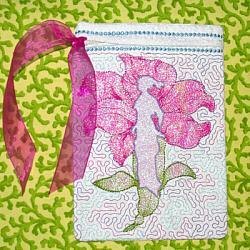 The mylar adds a nice bit a bling and the glow-in-the-dark thread lets it shine even at night. 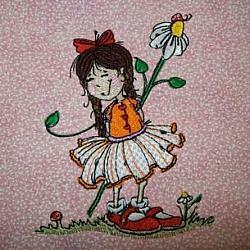 I have stitched out many designs of Michelle's from her Needlelittleembroidery.com site. All have been beautiful. I purchased the graduation card for 2012. I made 6 of the cards using their colors for their graduation caps and gold metallic for the tassel. All the recipents were so happy with the card and said that it will be one of their treasures from their high school graduation. Of course, they love the little check in the back pocket! Thank you for a wonderful design. I sewed the pirate design. I backed the design with 2 layers of iron on mesh and used the basting frame.It stitched out beautifully! Thanks for the great design!